Welcome to Season 3 of Nu Deco Ensemble! We are so excited to announce our third season programming! Tickets are on sale today for The Light Box and Bandshell performances - check back regularly for other individual tickets and new updates throughout the season. Purchase Your Season Three Light Box Subscription! Nu Deco returns to The Light Box for our third season with new symphonic suites of Outkast and David Bowie, stellar guest artists like R&B singer-songwriter Emily King, and some killer “Nu” music by David Lang, Paul Dooley, Daniel Wohl, and others all performed by your favorite 21st century, genre-bending orchestra! Don't miss one second of the magic by purchasing your season three Light Box subscription on sale today! As an added bonus until October 1st receive a FREE ticket to the Bandshell performance in January! We are so excited to share our Season Three dates with all of you. Join us on facebook over the next week as we provide you with a sneak peak into our season announcement with guests, suites, and new symphonic collaborations that will get you right of your chair! Is the anticipation too much? Then purchase your Nu Deco membership TODAY to lock-in your tickets for all of our Miami events this season: http://bit.ly/2iLdSRl! We are proud to announce our second season at Nu Deco Ensemble. This season brings a wealth of exciting concerts. Check back regularly for news and updates as our season progresses. Feature on Art Loft about Nu Deco Ensemble that was shown on WPBT2. Article in ArtBurst Miami by Miguel Estefan Jr.
Blog post by Jacomo Bairos on Knightarts.org. Nu Deco Ensemble Wins the Knight Arts Challenge! We are beyond thrilled to announce that we have won a $75k grant as part of the Knight Arts Challenge! More announcements soon! Great article on Nu Deco Ensemble in Knight Arts Blog by Gregory Stepanich! We are very excited to announce that Nu Deco Ensemble has been selected as one of 75 finalists for the Knights Arts Challenge in Miami! 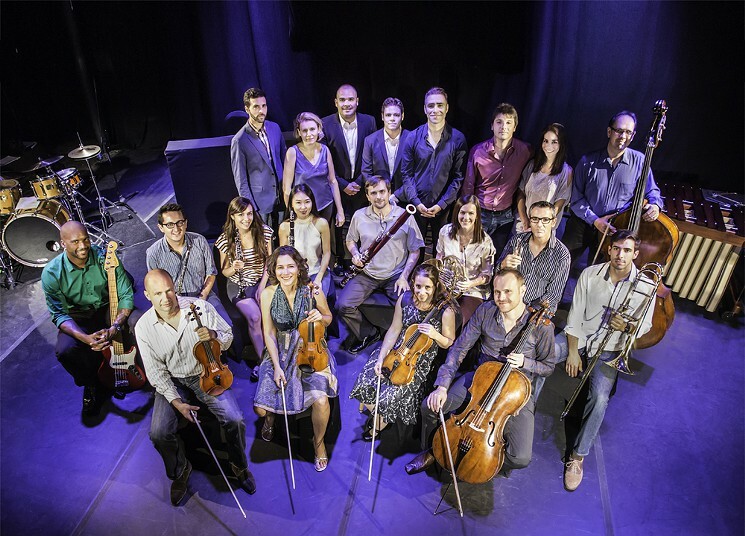 It gives us great pleasure to introduce an exciting and new professional performance ensemble in Miami. Nu Deco Ensemble strives to complement the existing pillars of artistic excellence, while bringing something unique to Miami’s cultural renaissance. With innovative programming, we aim to add to the cultural growth in Miami, while breaking new musical and collaborative grounds. Nu Deco Ensemble will be a vehicle for community collaborations with artists of all mediums, and strives to usher in an era of artistic richness. With educational initiatives geared toward illuminating tomorrow’s concert goers, as well as connecting young people in underserved areas of Miami, Nu Deco Ensemble will utilize technology, which can be used from the classroom to the concert hall. With composition workshops led by some of this generation’s most dynamic young composers, Nu Deco Ensemble will provide tools, assistance and passion to the younger composers of tomorrow. Our community engagement initiatives aim to bring intimate performances to environments where music and culture are absent. Nu Deco Ensemble will also serve as a mechanism to connect artists to one another throughout our eclectic city.